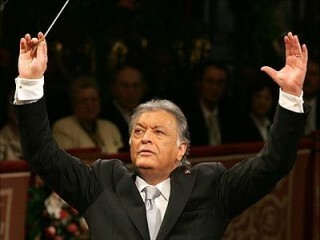 Zubin Mehta is an Indian conductor of western classical music. He is the Music Director for Life of the Israel Philharmonic Orchestra. On November 29, 2005 Mehta appeared with the Royal Concertgebouw Orchestra performing Bruckner's 8 symphony. On December 26, 2005, the first anniversary of the Indian Ocean Tsunami, Mehta and the Bavarian State Orchestra performed for the first time in Chennai (formerly called Madras) at the Madras Music Academy. This tsunami memorial concert was organised by the Madras German consulate along with the Max-Mueller Bhavan/Goethe-Institut. 2006 was his last year with the Bavarian State Orchestra. Mehta is an honorary citizen of Florence and Tel Aviv. He was made an honorary member of the Vienna State Opera in 1997. In 2001 he was bestowed the title of "Honorary Conductor" of the Vienna Philharmonic and in 2004 the Munich Philharmonic awarded him the same title, as did the Los Angeles Philharmonic and the Teatro del Maggio Musicale Fiorentino in 2006. At the end of his tenure with the Bavarian State Opera he was named Honorary Conductor of the Bavarian State Orchestra and Honorary Member of the Bavarian State Opera, and the Gesellschaft der Musikfreunde, Wien, appointed him honorary member in November 2007.